I have to admit also that I have made many card models over the years, both paid and free, and mikes efforts are really the best I have come across, not only because they look good as designed and built, but all of them lend their selves to to being butchered and modified quite easily, I dont know whether mike likes it or not, but they can all be made into other buildings for other uses, I use lots of "bits" of mikes kits,(doors, windows, walls,etc) as well as some modified buildings to help with my scratch building, so my hat is always tipped in your favor mike, and the fact that they are free, just adds icing on the cake. this stared out as "Arkwright's shop" and ended up as "Mikes Plaice"
and of course, a litter bin, and bench, and the ubiquitous, phone box complete with rusty, mildue'd and urine stained back wall. once again mike, you deserve a well earned thank you for all your time and skill. I'm really pleased to hear my efforts in providing these kits are being acknowledged, over the years I've even had a few words printed in model railway magazines so I must be doing something good. I do take it the earlier kits when compared to my modern stuff is like day & night, even after saying that we need to remember those early kits were also being designed in a word processor not graphic software. I started off using Microsoft Word & it got the job done, as I reached the limits to what Word could do I decided to spend some money on Corel Draw. AT first I really struggled & thought I'd wasted my money, but with a lot of failures came success as I started to learn how Corel Draw worked. Even today I'm still learning with some great help from the Corel Draw forums, I've now been shown easier & better ways to make brick archway. Wordsworth Model Railway cards kits has been & will always be to provide good freebies for fellow modeller that need them. 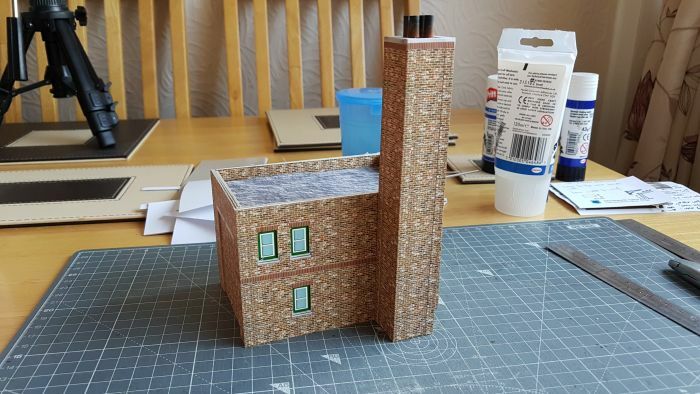 I take great pride when fellow modeller show me some of my kits on their own layouts, that buzz is worth everything. When somebody takes one of my kits & then takes it to the next level by going super detail on it, well that's like having strawberries & cream. I wish I could be as busy with the kits as I was in the early days but it's a hobby & sometimes other things take priority. All I can say I'm in it for the long haul, be patient & I'll always supply. 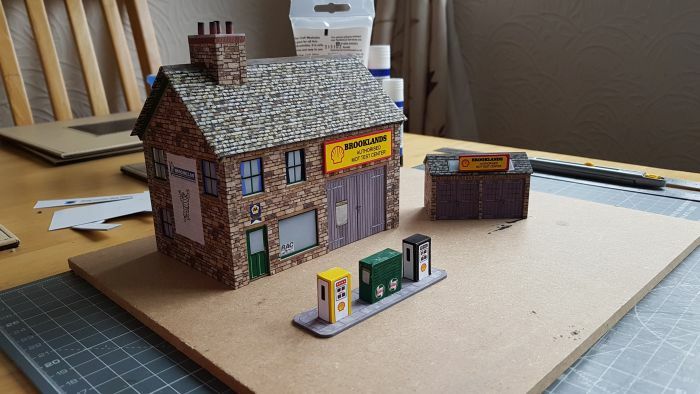 Like I said I have loads more to come, that corner shop just needs that test build, I've a new small petrol / service garage kit near completion which I need for my own layout. Ok I think you've heard me waffle on for too long, just can't thank everyone enough who have helped the WAR kits to get to where we are today. There's plenty of items in your kits that can be used even if we don't build the actual buildings. I've used the white goods, flooring from a kit and those cabinets in the chip shop can be used in multple places (workshops, kitchens etc). Been quite a productive weekend, completed designing my new small petrol station which I need for my layout, I've got it all printed off & ready for the test build. That's two full kits waiting to be built as still not started the terraced corner building kit yet. Whilst in Corel draw I had a hour or so with my low relief bonded warehouse, fun when you come back to a kit new ideas pop into your head which I hope will make this one even more versatile. Maybe start one of the test builds during the week if time allows. Thought I'd let you know where I'm at. Until next update, keep the card faith. I've found that card and paper models look better if the face is printed on a really rough paper, my favourite is the inside of large manilla envelopes. I'm lucky in having an office in the house which receives more than enough envelopes for my needs, and also posesses an A3+ rotary trimmer, which with two or three slices turns an envelope in two A4 sheets. It takes a little fidling with the colour settings to get it right but the results are worth it. My layout is set in Cotswold stone territory, removing most of the colour but leaving the shading then printing onto manilla paper gives a good representation. I cut the stonework for door and window openings and the quoins ( those big stone blocks at the corners) from the unprinted bits around the edge of the sheet and apply them individually. Someone recently was amazed that they were printed paper, he'd thought that I'd say there carving them from plaster. The biggest give away that something is printed paper is a sheen on the surface, eliminate that and the finish improves dramatically. long live the three foot rule, (or 18 inches in N-gauge), I know I go to extremes sometimes with tiny details that most people just dont or cant see, but thats just for me, I know they are there, but dont be too hard on yourself, your building looks great from what I can see, especially as it is in "N", remember the only one you have to please is yourself! I think the extended station looks great, I love to see these kind of modifications, it makes the kit more personal. Yes all my kits are ready to go, but they may just not meet fully what you want or the area you have in mind, my motto is go for it. Quite correct the only person you need to impress is yourself, so if your happy use it. I've been busy all day with my new small country style garage, had to make a few mods & updates but looking really good. Tomorrow I'll finish the last few bits & give it a go hopefully where I want it on my layout. Hi all, thanks for your words of encouragement. "long live the three foot rule, or 18 inches" - I like it (had to google it first ! ) , yes that makes a lot of sense especially with my aged eyes ! "it makes the kit more personal all my kits are ready to go" - Indeed they are and very good too. My first Daisy was as prescribed. However being in N I had trouble getting the corners of the three buildings folded sharp and straight enough to glue up well without gaps (fat fingers and those aged eyes ) but as it was all so much smaller in N I eventually realised that I could fit them all in one long net onto an A4 sheet with only one join in the final corner,,, if only I could learn how to drive GIMP !! Some time later I I managed to do "A" in the example pic below. Many thanks Mike, hours of fun ! 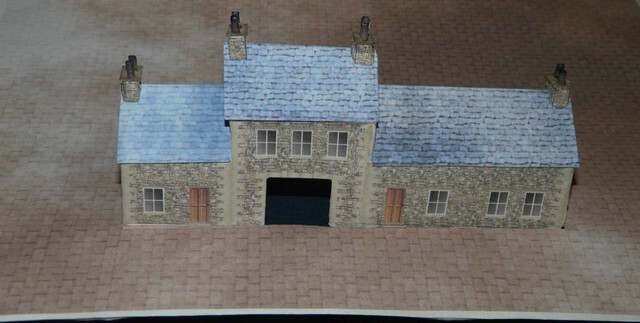 Extending kit buildings, Bordershed has done a good job on extending that stone station building, with quoins on the corners where they should be and stone infill between, but if you fancy an extended building without having to juggle the bits too much, adjust your history! If the building got extended after it was built so that a corner was no longer a corner you may well end up with a section of wall butted up to the original stone blocks that formed the corner. How it's joined in is likely to depend very much on the builders who carried out the extension, they also may not have got a perfect match either in size or colour of the new stonework, so feel free to use some that has printed out a slightly different shade. It's not only us kit bashers who add extra bits on to buildings, railway companies have done it right from the start, often being taken by surprise of the demand for their services. a lifelong basher and proud of it. Well it's been a long day but I do feel I've had a very good weekend with two kits that are now ready for uploading to the site. First we have the small country style petrol station. Here we have the front view. Here we havve the rear view showing the living quarters. 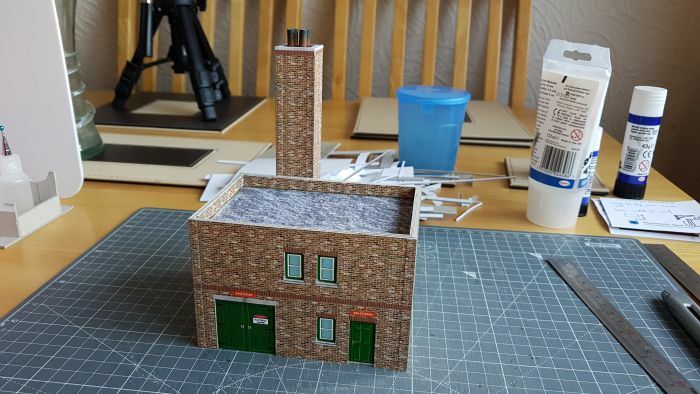 Now for the new sand / boiler house kit. 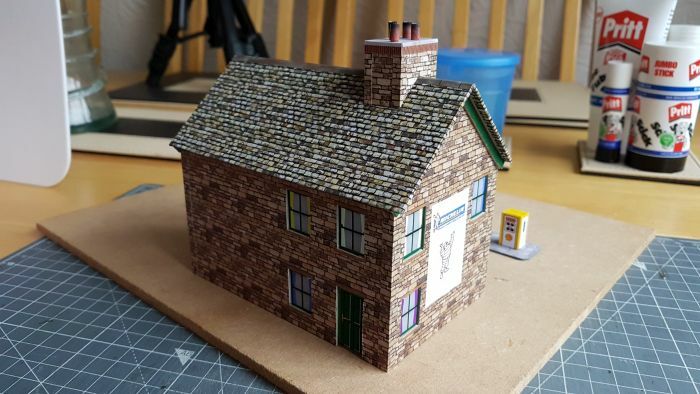 Just have the capping stones to glue in place to complete the full scene. Front view of the sand / boiler house. Now we have the rear view. I hope you like what you see, I'll have everything ready for uploading next weekend, so get you card & paper stock ready. Last edited by Montfort on Tue Nov 13, 2018 7:22 am, edited 1 time in total. I plan to build the tunnel portal kit but my skills are extremely limited. Is it easy to build? If someone has already built it, what are your advices? Thanks. Last edited by Montfort on Tue Nov 13, 2018 7:24 am, edited 1 time in total. but my skills are extremely limited. Print it off in Black and White to save ink and have a go at building it, if it doesn't turn out too well, print another off and try again, and perhaps even a third. You cannot learn skills from reading a book or watching a video, you have to give it a go and learn as you go. Share your experience in a Workbench thread, and if you get stuck ask for help, members will point you in the right direction.